His name’s Riley but he never gets riled — this 2- year-old American Pit Bull Terrier mix’s temperament is as calm as his delicate pink smile; he’s so pleasant we’ve never even seen him potty in his pen. Handsome Riley was found stray, a 55 lb. white and brindle gent with a naturally affectionate, laid-back style; he loves a nice head scratch, gets along fine with other dogs, thinks a pull toy’s a blast, is good on a leash, and can already sit for a treat. (Riley’s food motivated and would respond well to training.) 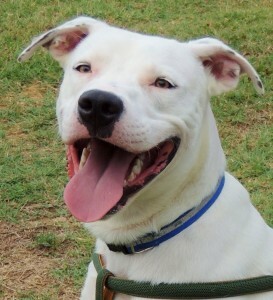 Riley’s destined to be a fine family dog; we suggest bigger kids because of his size, and a nice yard to run in, too. Come see how composed a young boy can be, and how easy it is to love an easygoing friend named Riley. 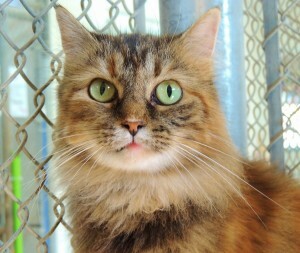 She’s spun from a cloud of tri-color fur; at 4 years and only 5 lbs., little Baby’s airy coat is bigger than she is, but the quiet personality underneath is as warm her soft terra cotta shading. Baby’s elegance is mostly unspoken (she’ll chatter vivaciously for food and treats.) Beyond that she’s content to rub her exquisite face on you, do velvety figure eights at your ankles, and generally remind you that she’s the most glamorous and dependable friend you’ve ever had. Baby’s fine with dogs but will take her time with other cats, mostly because she doesn’t see herself as one; and she prefers to live inside, where it’s easier to stay lovely. Baby’s already spayed and ready to go home with you today, come hold this weightless wonder in your hands and heart.